As crude oil production continues to decline, state-owned oil company Petrotrin has signalled the possibility of refining crude oil which was discovered in Guyanese waters recently, Trinidad’s Newsday yesterday reported. In 2016, US-based multi-national energy company ExxonMobil Corp. announced an oil discovery in the Liza field, some 193 kilometres just off the coast of Guyana, which may hold as much as 1.4 billion barrels of crude. “Following the completion of the Gasoline Optimisation Programme (GOP) at the Pointe-a-Pierre refinery in 2015, the refinery has resumed high throughput operations consistent with its capacity of 168,000 bpd (barrels per day),” Petrotrin said. 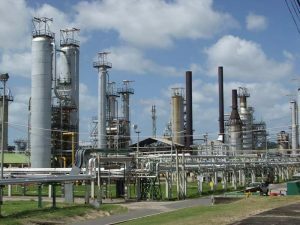 Guyana recently announced that it has retained an expert to examine the feasibility of building an oil refinery right in Guyana. This was after initial indications that there were no intentions. The US had said last year that there were no plans. Guyana has already announced plans to prepare in a big way for the oil production activities that will take place in ExxonMobil’s concessions, located just over 100 miles offshore Guyana. In addition to training and drafting of new laws, an on-shore site to provide services has been approved for Crab Island, East Bank Berbice. Several countries have come on board, offering help to Guyana to prepare for oil production, which is expected to commence as early as 2020.